The soundboard came kiln dried to about 8% moisture content from the supplier. Normally luthiers store their wood for years in order to season it - let it swell and shrink as the relative humidity goes up and down through the seasons. This will slowly stabilizes the wood and the sap will eventually harden giving the wood a ringing and responsive tone when you tap it with a knuckle. Recently, some luthiers have started experimenting with cooking the spruce in order to achieve this effect, a practice that apparently have been used by many other woodworking industries for centuries. However, scientific experiments have shown that when wood is heat-treated the fungi that cause decay are unable to survive, and the wood will not 'live' in the same way unbaked wood does. As a result, it hardly swells or shrinks, which makes it a extremely useful material for soundboards. It also stiffens the wood in the relation to it's weight allowing for a thinner and lighter construction. 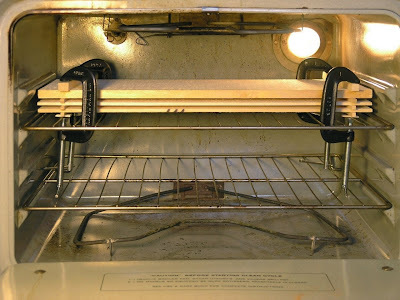 First I clamped the top to the oven grill with 3" C-clamps, adding only very light clamping pressure; Just enough to hold the clamps in place. I used some of my braces to sticker the top halfs and added a little pad of spruce between the grill and lowest braces in order not to marred them. 1. First evening; One hour at 180º F and let it cool in the oven over night. 2. Next morning; One hour at 190º F and let it cool until the evening. 3. Same evening; One hour at 200º F and left it to cool until the next morning. Not surprisingly, after each cycle the clamps had come loose as the wood had shrunk during the cooking. I didn't measure or weigh the wood before and after the baking so I have no data to share in that department. The wood did however seem to have a more responsive 'ping' when tapped. I never had the wood in the oven as I switched the oven on. Instead I waited until the oven had reached the desired temperature before I put it in. The guitar is being build in our unheated garage and I therefore I allowed two weeks acclimatizing inside the house before and after the cooking. On top of that it left our kitchen with a lovely smell of a sauna without the subtle trace of sweaty arm pits and bottoms.